The Edmonton International Airport expansion project, photo circa 2015. Iron Workers from Local 720 contributed to the construction of the new bridge. Image courtesy of the Local 720 Iron Worker's Union, do not reproduce. High above the rooftops, the iron giants balance and shimmy along beams, attaching one piece of strategically placed steel after another, connecting the dots like a children’s puzzle. The only caveat: this is no child’s game and the craft of ironworking isn’t meant for the faint of heart. Alongside the skill level that encompasses this trade, comes the fight for safe work conditions and healthy work environments from those looking out for its ironworking members, the Local 720. As you drive around Edmonton, you’ll notice the Local 720 flags flying proudly atop cranes and structures that the Local’s men and women tirelessly work on, crafting the skeletons of structures that add to the vibrancy of our fine city. Local 720 Edmonton Iron Worker’s Union members on construction site, circa 1980. Image courtesy of the Local 720 Iron Worker’s Union, do not reproduce. Iron working has been around since the turn of the 20th century, when steel virtually replaced wood and stone as the primary load-carrying material in the erection of bridges and buildings. This new demand brought a new type of worker to the labour scene: the bridgemen and architectural iron workers. In a lot of cases, these new iron giants were known as the “cowboys in the sky”—quite charming, considering our western Canadian city was being settled and booming with the introduction of industrialization. As Edmonton grew into a proper city, its expansion and need for buildings like schools, libraries, infrastructure and government offices continued to grow. Structures like the first bridge across the North Saskatchewan River, the Low Level Bridge (1901), connecting Strathcona and Edmonton, or others like the High Level Bridge (1913) and the Groat Bridge (1955) all helped connect Strathcona—and later, south Edmonton—with the north side of the city. As Alberta began its rapid industrialization after World War II, worker’s realized they needed to band together to protect their trade and advance their voices on the job and in the community. This is what sparked the birth of the Local 720, with a few pivotal people working to put ironworkers in its own protective community. More than the bridges connecting the city, a real estate boom began and by 1914, new structures in Edmonton like the Civic Block, the Courthouse, Tegler and McLeod buildings, University of Alberta, Royal Alexandra Hospital and more came to life. All of these structures were erected by steel workers and some of Edmonton’s own iron cowboys (and girls) before they joined together in the form of a union. Retired members of the Local 720 Edmonton Iron Worker’s Union members on construction site. Image courtesy of the Local 720 Iron Worker’s Union, do not reproduce. Back in 1949, founding members, Brothers Merrill Baker and Steve Senio, took it upon themselves to build a union. Although they were met with some harsh opposition, Baker and Senio’s version of the union started to take shape. It was initially chartered by the Canadian Labour Congress (CLC), the umbrella organization for Canada’s labour representation, as the Local 312. Members voted to join the International Association of Bridge, Structural, Ornamental and Reinforcing Iron Workers and the Local 720 torqued its last bolt as the union it is today when they were issued a charter on July 6, 1949. There are 14 names on the application for the 702’s charter, with four members initiated in 1949. Two of these initial members are still with the Local 720 to this day and celebrated 65 years with the union in 2014. To date, there are around 2,300 members aging in range from 17-90. According to the Local 720’s website, unions work for the people, using the power of collective action to get a fair share and give back to communities. 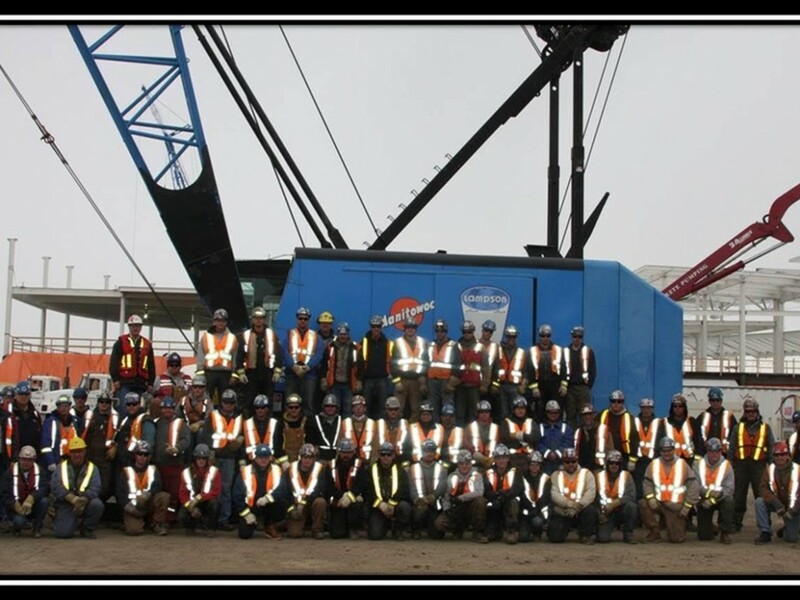 The Local 720, like many other unions, played a pivotal role in raising safety standards for its members on sites around Alberta. From its early years, to present day, the 720 manages a substantial pension and benefits plan, provides apprenticeship training and represents workers in collective bargaining and improved working conditions. There’s a lot to be proud of being part of a union, like the 40-hour work week, eight hour work day, paid vacations, sick leave…you name it! Those basic necessities that we think are a necessity of our job are things that unions like the Local 720 fought for on behalf of its members and their best interests first. The Edmonton International Airport expansion project, photo circa 2015. Iron Workers from Local 720 contributed to the construction of the new bridge. Image courtesy of the Local 720 Iron Worker’s Union, do not reproduce. Unions have been a large part of Edmonton’s blue collar make up and the Local 720 is no different. The 720 also helps in the form of union representation, dispatch services, training and apprentice programs, and pension and benefit programs. It has been a beneficial place for young workers to get their feet wet and helps those with more experience mentor the newer generations. Ironworking requires a lot of grit to work in the profession as long as some of the 720’s members have. Workers are exposed to all kinds of weather conditions (just picture a -40℃ day in the middle of Edmonton’s winter), working with heavy beams and lugging weighty tools around to tackle the job. This hasn’t hindered its members in bringing more young apprentices on board, including female ironworkers, the first of whom was Irene Boilard, who joined in February, 1975. The Walterdale Bridge Project, photo circa 2015. Iron Workers from Local 720 contributed to the construction of the new bridge. Image courtesy of the Local 720 Iron Worker’s Union, do not reproduce. As Edmonton’s downtown gets a much needed sprucing, adding new structures like Roger’s Place and its village of skyscrapers and community gathering places, the game of crane spotting is something to keep citizens’ interests piqued. In 2015, there were 23 cranes spotted in our skyline at any given moment and it will continue as our city grows and matures. Like so much of Edmonton’s downtown, old buildings that have stood as a pillar of regality and our built history are now in need of restorations of all shapes and sizes. For some buildings long past their prime, the hope of preserving them is far gone but when you think about structures such as the High Level Bridge or the Fairmont Hotel MacDonald, there is a place for revitalizing these once shiny, new structures for new generations to admire. Since 1949, buildings like the city’s first skyscraper at 26 storeys, the CN Tower (built in 1966), the James MacDonald Bridge (1971), West Edmonton Mall (1981), the Edmonton Convention Centre (1983)—now known as the Shaw Conference Centre—and the new Art Gallery of Alberta (2010) have all helped shape our city. Other significant structures in our city include Commonwealth Stadium, the recent expansion at the Edmonton International Airport and Rogers Place. Rober’s Place structural work completed by Local 720 members. Image courtesy of the Local 720 Iron Worker’s Union, do not reproduce. The Art Gallery of Alberta. Local 720 Iron Workers contributed to the construction of this iconic building, completed in 2010. Image courtesy of the Local 720 Iron Worker’s Union, do not reproduce. Years from now, as we attend hockey games and music concerts with our kids, Rogers Place and the new Walterdale bridge will have a place in Edmonton’s history. The care and attention our city’s ironworkers, among the other trades who make these structures a reality, proudly stand showcasing their work like the hard working people this city is made of. Buildings are historical reminders of where we have come from and the people who turn these ideas into reality are a part of its magic. It’s no wonder that the Local 720 has had a place in making this city come to life and will continue for many years to come. International Association of Bridge, Structural Ornamental and Reinforcing Iron Workers (2011). Who We Are. Edmonton Public Library (2004). Goyette, L. and Roemmich, C. The City Called Home, City Centennial Project: Edmonton Timeline. Ironworkers Local 720 (2014). Our History.